Our charcoal briquets are used by some of the best chefs in the country, to get the flavor they demand. Whether you’re a home griller, or traveling to BBQ competitions, you’ll taste the difference with our charcoal, and you’ll keep coming back for more. 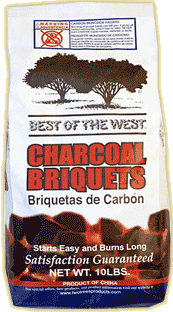 We make our Best of the West® Charcoal Briquets with the same great quality as our Mesquite Lump Charcoal. Best of the West® Charcoal Briquets are a great fuel base to combine with our wood chips or wood chunks for a great cooking experience.